Cellulose Insulation – This type of insulation is made from recycled paper which has been treated with a flame retardant, and is blown into either attics or walls. This type of insulation has a higher R-value per square foot when compared to loose blown or rolls of Fiberglass Insulation. What this means, is that you can achieve the same R-value with less insulation. However, it is important to note that loose blown insulation (regardless of type) will settle over time, and that the initial depth of the insulation will be higher (by roughly 10-13%) than is necessary. The baseline R-value for cellulose insulation is 3.8 per inch. Fiberglass Insulation – This type of insulation is made from fiberglass and is typically installed by cutting large strips off of a larger roll and it is then secured into place using a staple gun. This type of insulation has a lower R-value when compared to cellulose insulation, and as a result, you will need a greater depth of material in order to achieve your home’s desired R-value. The baseline R-value for fiberglass insulation is 3.2 per inch. 1. Take your ruler and push it down through your insulation. Simply take your ruler and push it down through or next to your attic’s insulation. Then take note of how far down the ruler goes before hitting the bottom of your insulation. 2. Repeat the first step at several different spots in your attic. It’s important that your attic is properly (and evenly) insulated across the entire area of the attic. 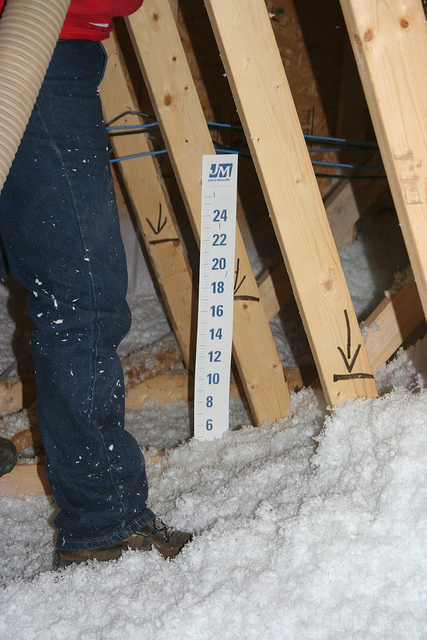 Be sure to check several different locations to ensure that your attic is evenly insulated. 3. Multiply the depth of your attic’s insulation by it’s corresponding R-value. If your attic is filled with cellulose insulation, you’ll multiply your depth by 3.8. If it’s insulated by fiberglass you’ll multiply it by 3.2. 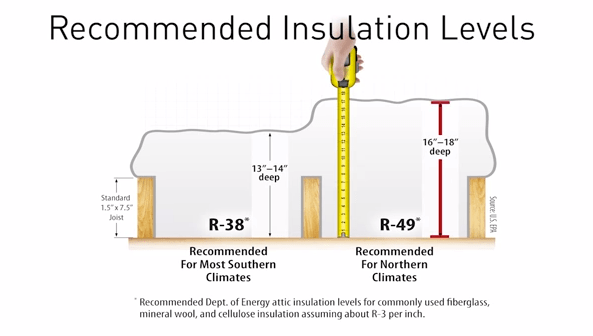 Now, take your number and compare it to the following graphic to see if your attic is properly insulated. If you’re attic is coming up short, consider having a local professional come in and add insulation to your home’s attic.